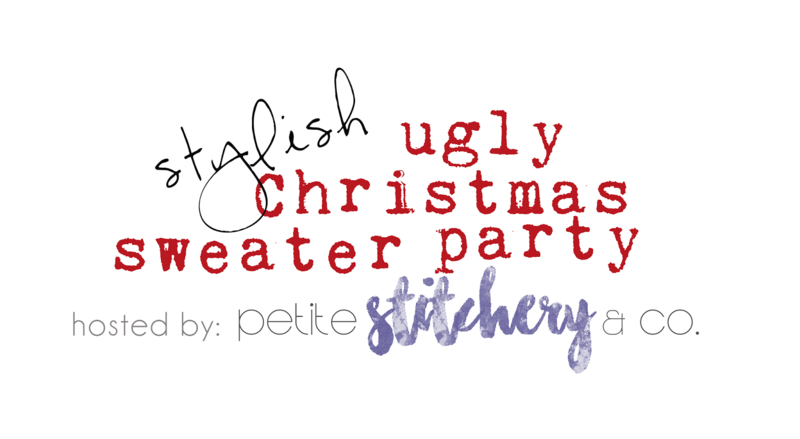 I love a good party so I was all on board when Petite Stitchery said they were hosting an Ugly Sweater Party. Who doesn’t love a fun ugly sweater?!! I’ve loved the Rosemary Cowl Crop since the very first preview I saw and knew it would be perfect for this tour. I think an ugly sweater is all about upcycling so for my version I grabbed a cozy blanket from good ol’ Wal-mart. It worked perfect and I loved being able to use the blanket edge for the bottom hem too! I did a little tricky hacking to make the sweater just one layer. This fleece is so thick and cozy that I didn’t want to add too much bulk. I used a scuba knit stripe for the cowl and cuffs. I sewed the cowl on like a neckband. The sleeve cuffs kinda stumped me. They are sewn like a lining about 7 inches up the sleeve and rolled up for a nice, thick contrast cuff. Make sure you add your holiday ugly sweaters to the link up for a fun giveaway! I love the color combi, so pretty! love the sleeve cuff, looks awesome! I really love the colours on your sweater. The contrast between the stripes and the red is amazing! I would totally wear that sweater myself! Great job, Tami! Love your work.